2000AD Comic Prog #489 (27th September 1986) | 'TAIN'T THE MEAT… IT'S THE HUMANITY! 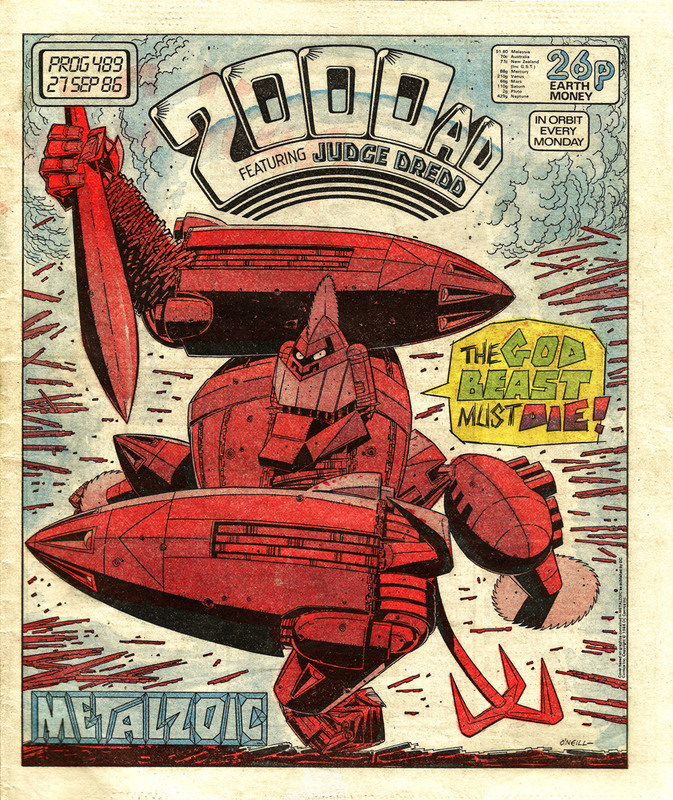 Cover dated 27th September 1986, this issue of the weekly British sci-fi comic depicted a decidedly pissed-off looking Armageddon from O’Neill’s and writer Pat Mills’ ten-part story Metalzoic. This is another great cover from O’Neill, a deceptively simple image that grabs the reader’s attention. And what a cover line – ‘The God Beast Must Die!”. Classic Mills. The rest of the issue is as strong as the cover. The final part of the Strontium Dog story ‘Rage’ kicked off the prog with Johnny Alpha finally getting his revenge on the man who murdered his partner, Wulf. Next up was the single page Sooner or Later followed by another instalment of the light-hearted Ace Trucking Co. A two-page Tharg’s Future-Shocks came next featuring an early writing credit for Neil Gaiman, who would soon find fame with his Sandman series for DC Comics. Judge Dredd received the full-colour centre spread treatment while part seven of Metalzoic rounded off the issue. O’Neill contributed a hand full of covers to 2000AD comic in late 1986 and early 1987. I’ve already looked at a few (click here) and I’ll be taking a closer look at his cover from Prog #497 very soon.